Speaking for choosing the right hair color, here's a very useful guide from WikiHow about 3 Ways to Choose the Right Hair Color. Going back to Unica Hija, particularly the salon (that's because they have other ventures like apparel etc. ), I enjoyed the ambiance at this salon branch with the images below. The overall ambiance is very relaxing. They also offer free drinks like other establishments. Coffee for me please! The hairstylist and his assistant were also both very friendly and professional that I don't think I remember ever enjoying salon time this much for years. 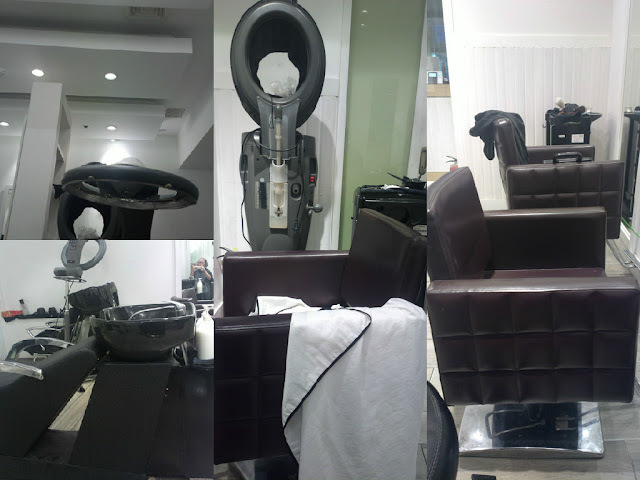 Well, I don't even visit salons often; like once a year maybe for a hair cut and the usual hair color change each time. The last time I had dyed my hair was a completely forgettable experience that I have actually forgotten about it and kept on mentioning that my last hair color was 2 years ago. But it was actually just late last year in a popular salon franchise where I paid twice more than Unica Hija's rate for the same service. As for Unica Hija, they didn't even suggest an expensive rebond and only opted to offer Keratin related treatment (next time maybe!). I normally use products with keratin anyway. See post Keratin Conditioner for Hair Repair.